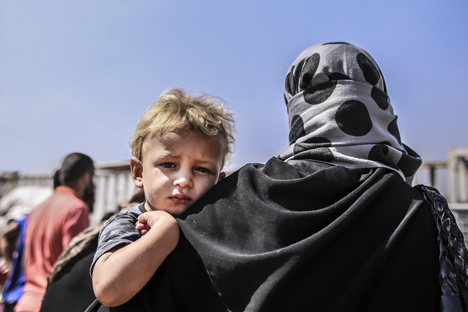 Most Russians are favorably disposed to refugees from the Middle East and blame the authorities of the United States and Middle East countries for the migrant crisis, the Russian Public Opinion Study Center (VTsIOM) said, referring to a poll of October 10-11. According to the poll, most respondents (86 percent) are more or less aware of the influx of Middle East migrants to EU countries. Only 12 percent have never heard about the migrant crisis, and 2 percent were undecided. Practically half (49 percent) of respondents said the hostilities and bombardments in the migrants' home countries forced them to move. Ten percent said that people were looking for a better life, and seven percent dubbed poverty and the need to earn money as the main motivation. In the opinion of 6 percent of respondents, U.S. aggression and political problems had caused migration of people from the Middle East to the European Union. Four percent mentioned unemployment, terrorism and the wish of migrants to save their lives. Only 3 percent of Russians think that the migrants wish to get an allowance in European countries and to become dependents, and 1 percent said that the situation was engineered to destabilize neighboring countries. Seventeen percent found it difficult to answer the question. Most Russians blamed the United States (36 percent) and the authorities of Middle Eastern countries (16 percent) for the exodus of Middle East residents. Nine percent pointed the finger at world politicians, and six percent put the blame on the European Union. The respondents also mentioned ISIL and terrorists in general (5 percent), refugees themselves (2 percent), NATO, the western coalition and people who triggered that war and created an appropriate environment (1 percent) in each category. Two percent said the hostilities were the cause of the crisis. Practically a quarter (24 percent) was undecided. The respondents were free to give an unlimited number of answers to the questions about reasons for the influx of refugees to EU countries and culprits behind the exodus from the Middle East. Sixty-one percent of Russians said they sympathized with the refugees, and 21 percent said they did not care. Five percent said they respected the migrants, and 4 percent either liked or disliked them. Three percent condemned persons who fled their home countries, and 1 percent felt malicious joy. Five percent said they had other sentiments and 5 percent were undecided. Twenty-nine percent of Russians said they respected countries that took in refugees. Twenty-two percent were indifferent to those countries, and 22 percent said they felt sorry for the countries that opened their borders to refugees. Eleven percent expressed their liking for countries taking in refugees, and 7 percent condemned the actions of European authorities. Four percent of respondents admitted that they disliked EU countries admitting refugees to their territories, and 2 percent felt malicious joy. Four percent gave other answers, and 8 percent were undecided. The respondents were free to give no more than two answers to the questions about their feelings towards refugees and host countries. The sociologists polled 1,600 persons in 132 populated localities in 46 regions.